Today we met up with the ARC team to formally enter Panama at Porvenir island, the administrative centre of the San Blas group. There is a reef at the entrance to the lagoon at Porvenir, but this was well marked for us by what Bertie termed a "failboat". 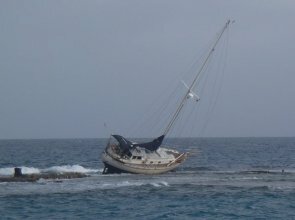 Someone who trusted their GPS too much and didn't use "eyeball navigation" to avoid the reefs. This boat has been on the reef for three months but as you can see it still has flags flying, bimini up, radar dome and mainsail in its sailbag. Apparently the boat has a Panamanian owner and the Porvenir authorities are looking after it while it is "on the hard". After check-in we motored over to Chichime Cays for an ARC get-together with a pot-luck (everyone brings something along) lunch, which was surprisingly well provisioned given all the food had come from St Lucia. The Kuna's provided coconuts with rum poured in and there was a group dancing and playing the pipes. Andrea bought a mola to hang on the wall in Anastasia. There are some beautiful jellyfish in San Blas that look like something from Star Trek at night. They are luminous but, rather than just flashing on and then fading, the luminosity is animated. First a bright light circles once or twice around the "nacelle" and then it streams down the tentacles before fading away. You have to wonder what kind of evolutionary advantage led to the jellyfish developing that ability.